Life doesn’t have a replay button. You need a camera that doesn’t make excuses. 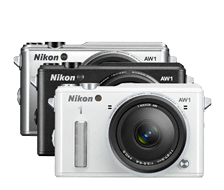 The Nikon 1 AW1 delivers high quality images anywhere with its tough, waterproof, shockproof, freezeproof construction. Don’t miss the perfect shot with the world’s fastest continuous shooting frame rate (approx. 15 fps with AF)*, and features like Slow View and Live Image Control. Shoot Full HD video and share your images wirelessly using the WU-1b Wireless Mobile Adapter. This is the only camera you’ll need for wherever life takes you. At last, stunning images from a camera you don’t need to baby. From kayaking to mountain climbing, keep the rugged Nikon 1 AW1 by your side. Waterproof to 49 feet without a bulky protective housing—carry it rafting, swimming or snorkeling. Freezeproof to 14°F and shockproof to 6.6 feet, it’s ideal for snow sports and biking. Geotag images with the built-in GPS to share on GoogleEarth™ or other GPS-based social networking sites. Never miss a memory again. Whether it’s a monster snowboard trick or your daughter’s first dance recital, trust important moments to the world’s fastest continuous shooting frame rate (approx. 15 fps with AF)* camera. 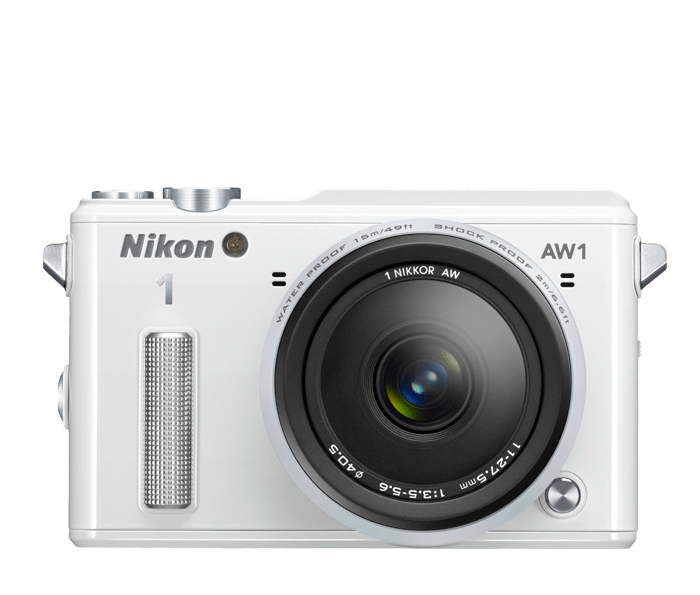 Shooting at 60 FPS fixed focus or 15 FPS full autofocus; the Nikon 1 AW1 also features a 1-inch 14.2 megapixel CMOS image sensor for superior image quality even in low light conditions. Life doesn’t have a replay button, but the Nikon 1 AW1 does. Have you ever missed a photo because you pressed the shutter a split-second too late? Never again! Slow View Mode allows you to slow a clip of action and then select a perfectly timed shot. Get creative with the easy-to-use Live Image Control by simply sliding the control bar to preview effects such as Background Softening or Motion Blur. Share your adventures at the speed of life. The Nikon 1 AW1 isn’t just a rugged photo-taking companion; it’s ready to share your creations as well. Upload high-quality creative images and videos anytime, anywhere, to your smartphone, tablet or other Wi-Fi enabled device± using the WU-1b Wireless Mobile Adapter (sold separately), then share to social media sites, email or text to friends and family. Shoot Full HD 1080p video where no interchangeable lens camera ever could before—underwater, in freezing temperatures, and in the middle of the action, so don’t hold back. The Nikon 1 AW1 is ready to multi task, shooting video while simultaneously capturing high-quality still images. Don’t worry about interrupting your video, just depress the shutter-release button at any time during HD Video recording. Action doesn’t wait. Don’t lose time navigating menus, especially in extreme conditions. Simple Graphic User Interface menus and Action Control, make navigating menus easy using a tilt of a gloved hand. Even more exciting, an integrated altitude indicator, depth gauge and virtual horizon add exciting details to your images. Relive extraordinary moments in tack-sharp detail. The Nikon 1 AW1’s 1-inch CX-format CMOS image sensor delivers images superior to cell phones and compact digital cameras, even in low light. This camera’s Wi-Fi® capability using the WU-1b Wireless Mobile Adapter can only be used with a compatible iPhone®, iPad®, and/or iPod touch® or smart devices running on the Android™ operating system. The Wireless Mobile Utility application must be installed on the device before it can be used with this camera.